One of things I enjoy most about maps is to immerse myself in thoughts of the physical places I'm peering at through the looking glass. My imagination runs wild thinking about all the locations on a world map. For me, this wanderlust and mapgazing is a daily activity. In doing so, occasionally I'll run into a map feature that is a real head-scratcher. 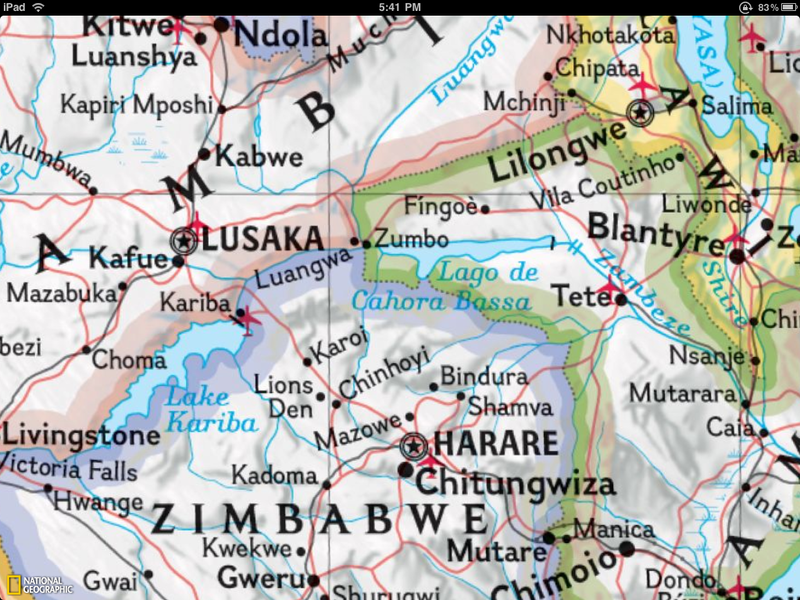 Last week I was searching in the area around the Okavango Delta in Botswana and Lake Kariba between Zambia and Zimbabwe when I came across what looked to be a phantom "l" on the map. 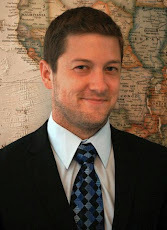 I was quite pleased with myself as I thought I had discovered an error on the National Geographic 2007 Africa map. I became puzzled when I found a similar "l" to the east at the eastern edge of Lake de Cahora Bassa in Mozambique. While it was hard to believe National Geographic made a mistake, two mistakes right next to each other was a laughable notion. The image below shows the area in question and both lines. 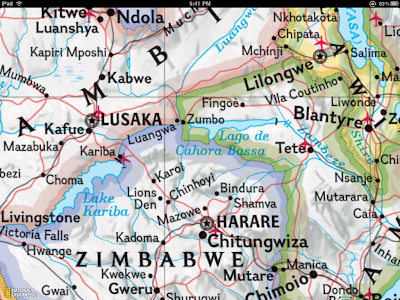 One is to the southwest of the City of Kariba, the second is on the eastern end of Lake Cahora Bassa. I scoured the legend on all my National Geographic maps but couldn't find anything that matched the symbol. It most closely matched that of passenger railroad but both the size and logic of placement was off. Why would someone build a railroad bridge across a large body of water if it didn't connect to anything on either side? Time to search Google Earth and put the mystery to bed! It turns out that the mysterious line represents a dam. With the help of a friend we quickly discovered another dam in Turkey. They are only visible in the continent blow up maps from National Geographic. 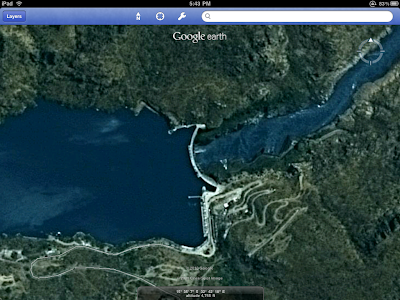 Below, in this week's Google image of the week, we see the Cahora Bassa dam in Mozambique. Remember, clicking on the images will take you to a full sized image.